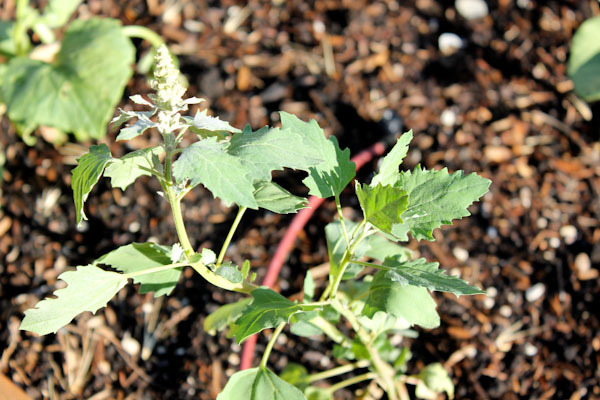 At Whole Foods over the weekend, I impulse bought a quinoa starter plant to add to our garden. It looks like a weed, I would never have guessed it produces such a hearty grain. From what I’ve been reading, we’re not gonna get much from it and it will only grow about 2′ tall. But this should be a fun experience at least and sprouting whatever I harvest from the little plant for salads and more quinoa. 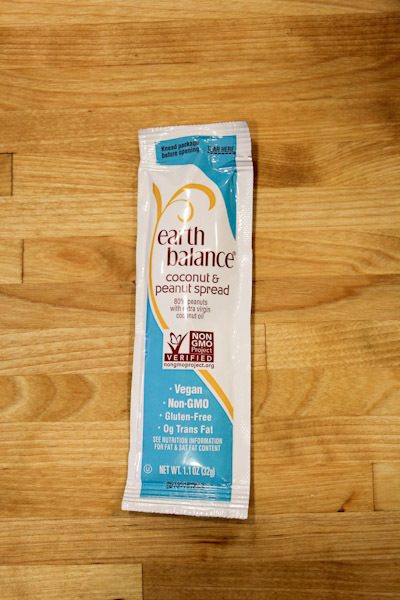 One of the fun goodies scattered on the dining tables for breakfast at Vida Vegan Con were these little pouches of Earth Balance Coconut & Peanut Spread and I ended up bringing a few of them home. I’m not a huge bread and peanut butter person and I thought about just eating it straight up, it’s basically creamy peanut butter with a little coconut oil blended in. 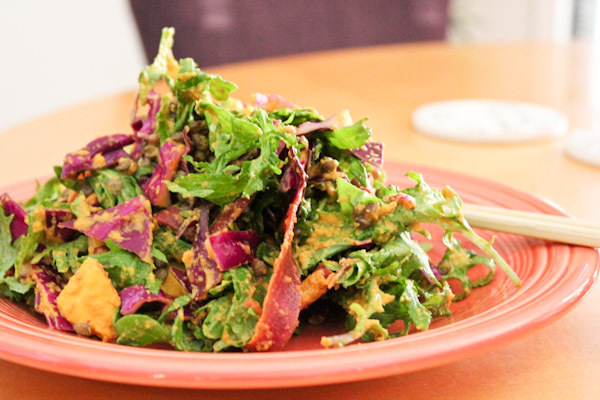 Instead it inspired me to create a spicy peanut dressing to coat a kale and red cabbage salad. And you could use whole almonds, regular peanut butter, almond butter, or shelled hemp seeds in this dressing in place of the Coconut & Peanut Spread. 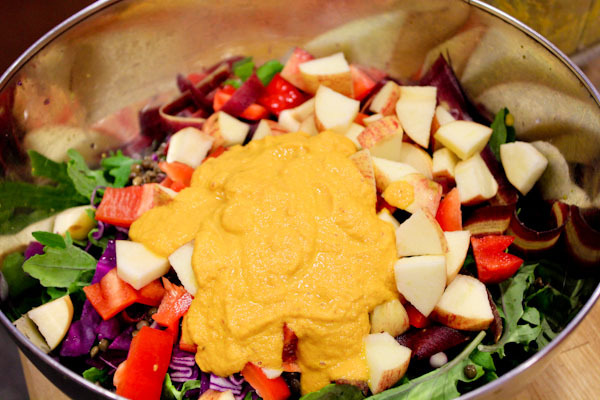 The texture and color is very much like a thick carrot ginger dressing, but this one has an intense flare with a rich peanut butter texture. 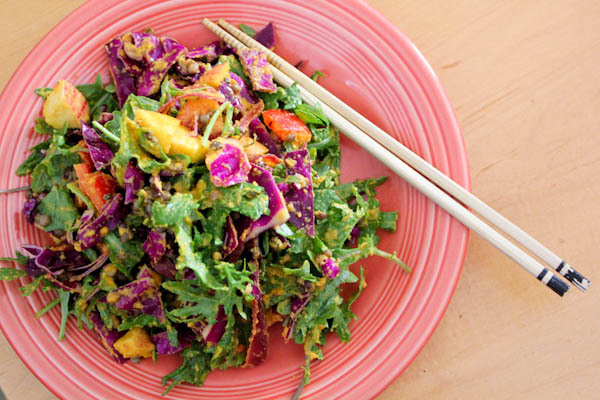 And adds warmth to a visually pleasing and crunchy salad. You can reduce the red pepper flakes to taste for less heat. With added steamed lentils, it made a satisfying meal salad. 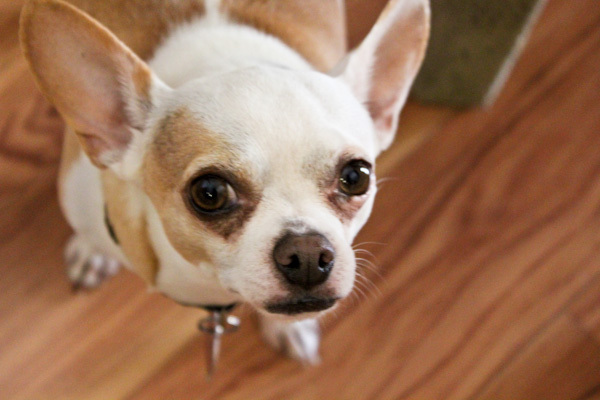 Poor Miko was bummed I wouldn’t share spicy salad with him. Nope, it was all mine! But he did get carrot treats. A Quinoa starter kit, eh!? No kidding! I’m looking forward to the updates on this! Yes, it should be interesting and the heat has not killed the plant yet!